In Odoo.sh, a build is considered as a database loaded by an Odoo server (odoo/odoo & odoo/enterprise) running on a specific revision of your project repository in a containerized environment. Its purpose is to test the well-behavior of the server, the database and the features with this revision. In this view, a row represents a branch, and a cell of a row represents a build of this branch. 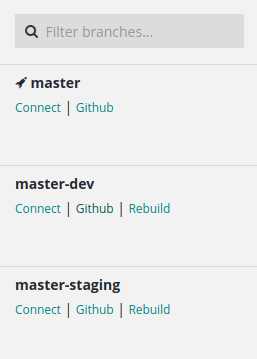 Most of the time, builds are created following pushes on your Github repository branches. They can be created as well when you do other operations, such as importing a database on Odoo.sh or asking a rebuild for a branch in your project. A build is considered successful if no errors or warnings come up during its creation. A successful build is highlighted in green. A build is considered failed if errors come up during its creation. A failed build is highlighted in red. If warnings come up during the creation, but there are no errors, the build is considered almost successful. It is highlighted in yellow to notify the developer warnings were raised. Builds do not always create a database from scratch. For instance, when pushing a change on the production branch, the build created just starts the server with your new revision and tries to load the current production database on it. If no errors come up, the build is considered successful, and otherwise failed. The first build of a production branch creates a database from scratch. If this build is successful, this database is considered as the production database of your project. From then, pushes on the production branch will create new builds that attempt to load the database using a server running with the new revision. If the build is successful, or has warnings but no errors, the production database will now run with this build, along with the revision associated to this build. If the build fails to load or update the database, then the previous successful build is re-used to load the database, and therefore the database will run using a server running with the previous successful revision. The build used to run the production database is always the first of the builds list. If a build fails, it is put after the build currently running the production database. Staging builds duplicate the production database, and try to load this duplicate with the revisions of the staging branches. you can play around as much as you want in the same staging database, and you can then ask for a rebuild when you want to restart with a new copy of the production. Nevertheless, this means that if you make configuration changes in staging databases and do not apply them in the production, they will not be passed on the next build of the same staging branch. Development builds create new databases, load the demo data and run the unit tests. A build will be considered failed and highlighted in red if tests fail during the installation, as they are meant to raise errors if something wrong occurs. If all tests pass, and there is no error, the build will be considered successful. According to the list of modules to install and test, a development build can take up to 1 hour to be ready. This is due to the large number of tests set in the default Odoo modules suite. The production branch will always appear first, and then the other branches are ordered by last build created. You can filter out the branches. For each branch, you can access the last build's database using the Connect link and jump to the branch code using the Github link. For other branches than the production, you can create a new build which will use the latest revision of the branch using the link rebuild. This last link is not available when there is already a build in progress for the branch. For each build, you can access the revision changes using the button with the Github icon. You can access the build's database as the administrator using the Connect button. Also, you can access the database with another user using the Connect as button, in the dropdown menu of the Connect button. 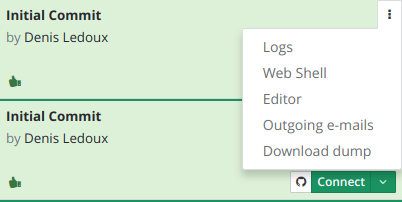 In the dropdown menu of the build, you can access the same features than in the branches view: Logs, Web Shell, Editor, Outgoing e-mails. You also have the possibility to Download a dump of the build's database.